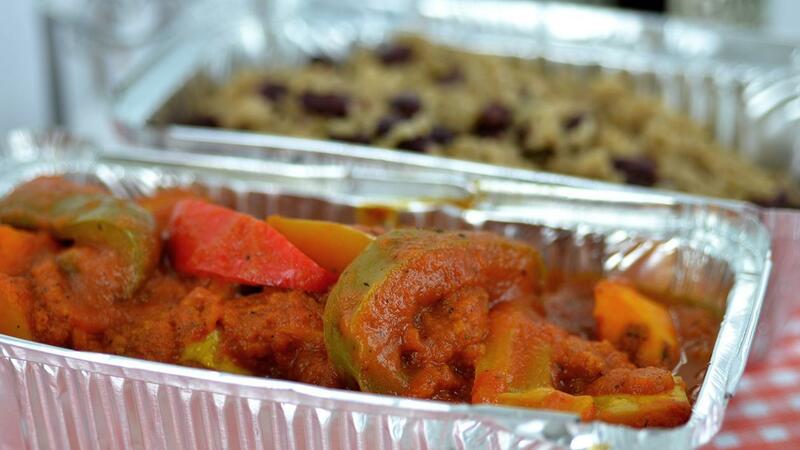 Try this vegetable curry recipe to surprise your vegetarian guests with an authentic Jamaican main course. Serve together with Long Grain Rice and peas as a side dish and add Jamaican Jerk Paste for the perfect flavour. Dice the butternut squash, keeping the skin on, into 2cm pieces. Cut the peppers into 2cm thick strips removing the seeds. Blend the KNORR Patak's Korma Paste, tinned tomatoes, onions, water, dried thyme and KNORR Professional Garlic Puree until smooth. Place the sweet potatoes and butternut squash in a pan with the oil and sweat for 10 min. Pour in the blended sauce and the mixed peppers. Cover and cook for a further 20-25 min. or until the vegetables are cooked. Place the KNORR long grain rice, KNORR Jamaican jerk paste, water, light coconut milk, dried thyme and kidney beans into a pan. Bring it to the boil then stir. Reduce the heat to a simmer and cook for 10-12 min. Remove from the heat then cover with clingfilm and allow to steam for 5 min.